As the power of wind farms (WFs) considerably proliferates in many areas worldwide, energy storage systems will be required to dynamically compensate the wind energy intermittency and increase power system stability. 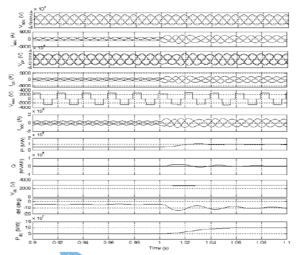 In this paper, a backup power conditioning strategy for wind energy-fed voltage source converter HVDC transmission systems is presented. An induction machine based flywheel energy storage systems (FESS) is integrated to the HVDC system via a solid state transformer (SST). The FESS is connected in parallel with the dc-link of the grid side converter; therefore, the excess wind energy can be stored in the flywheel and then restored during the energy shortage periods. The proposed system aims to compensate the power fluctuations caused by the intermittent nature of wind energy, levels the power-fed to the grid, and improves the quality of delivered power. The proposed system including FESS with an interfacing SST is modeled, simulated, and analyzed in MATLAB/SIMULINK environment. The results verify the effectiveness of the proposed system. Figure 2. 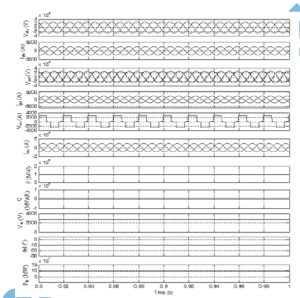 Simulation results of power smoothing operation in pu (a) grid power, wind power, and flywheel power, (b) flywheel speed, (c) phase shift between two H-bridges of DAB, (d) HV dc link, (e) LV dc link. Figure 3. 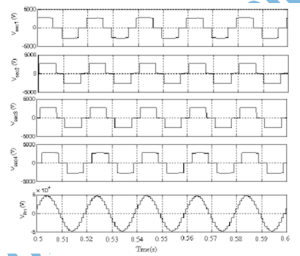 Simulation results of HFT waveforms, in pu, employing soft switching using phase shift technique (a) positive power flow (from H2 to H1), (a)negative power flow (from H1 to H2). Figure 4. Simulation results of power leveling operation in pu. 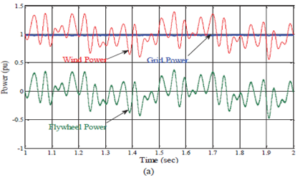 In this paper, a new strategy of improving the integration of large scale wind farms into HVDC transmission system using SST based FESS has been proposed to compensate for the wind power oscillations and to enhance the power profile at grid side. 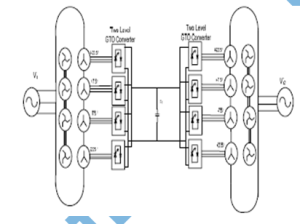 In the proposed technique a low speed induction machine based flywheel energy storage system is connected in parallel with the DC link of the grid side converter. Therefore, the excess wind power is stored in FESS and restored in case of wind power shortage and/or power demand increase preserving the grid power profile at its required value. The simulation results have demonstrated that the FESS compensates for power fluctuations caused by wind nature during different load conditions and exhibits good system performance with a relatively fast response and high dynamics. Schettler, and H. Huang, N. Christl, “HVDC transmission systems using voltage sourced converters design and applications,” Power Engineering Society Summer Meeting, 2000. 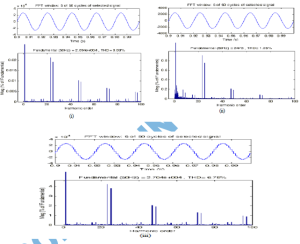 IEEE, vol.2, pp.715-720 vol. 2, 2000. Long and S. Nilsson, “HVDC transmission: yesterday and today,” Power and Energy Magazine, IEEE, vol.5, no.2, pp.22-31, March-April 2007. P. Bahrman and B.K. Johnson, “The ABCs of HVDC transmission technologies,” Power and Energy Magazine, IEEE, vol.5, no.2, pp.32- 44, March-April 2007. M. Kirby, Lie Xu; M. Luckett, and W. Siepmann, “HVDC transmission for large offshore wind farms,” Power Engineering Journal, vol.16, no.3, pp.135-141, June 2002. Jiancheng Zhang, “Research on Flywheel Energy Storage System Using in Power Network,” International Conference on PowerElectronics and Drives Systems, 2005. PEDS 2005, vol.2, no., pp. 1344- 1347, 28-01 Nov.2005.